For this edition of This Week in Co-Op, Nick and I decided to play something a little more old school. Luckily for us, Sega has been pumping out some classic vintage collections. Golden Axe is one of my all time favorite arcade titles, so we decided to dive into the sword an sorcery adventure. I don't know what's aged worse, me or the game. Thank god for unlimited continues. We trekked through the Turtle Village, crossed the back of the Giant Eagle, and slayed dozens of savage foes while on our journey to battle Death Adder. Nick took control of the ax-wielding lightning dwarf, Gilius Thunderhead, and I played as the bikini-clad fire maiden, Tyris Flare. I don't mean to brag, but I used my magic expertly, and masted the art of pit jumping. I may be the greatest Golden Axe player of all time. For some reason, Nick edited out all of my cool moves and left in the gnome sequences. If it looks like I'm playing left handed, or maybe even with my eyes closed, it's because the gnomes are short. I'm not good at fighting things smaller than me. Because I'm such a badass. Anyway, enjoy the video. We smash stuff and talk about it. 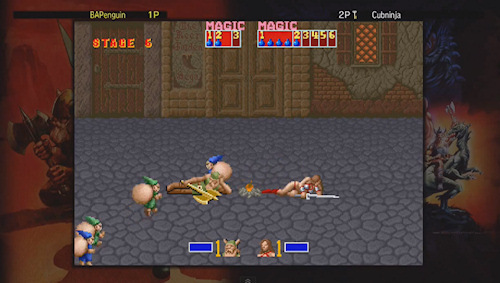 SEGA's Golden Axe Vintage Collection features two player local or online co-op play. It contains the arcade version of Golden Axe and the Sega Genesis versions of Golden Axe 2 and Golden Axe 3. Page created in 0.8841 seconds.